Cake decoration is not taken seriously at Flavzcorner yet. The pictures explains that ...lol. Whenever a birthday approaches in my family, that's when I will be thinking of cake decoration. I adore the cake decoration, but never put a real effort to perfect them. Butter cream frosting is not my favorite, but if offered I would never deny a piece of cake that is frosted with butter cream. I am all for the light whipped kind of textured frosting. 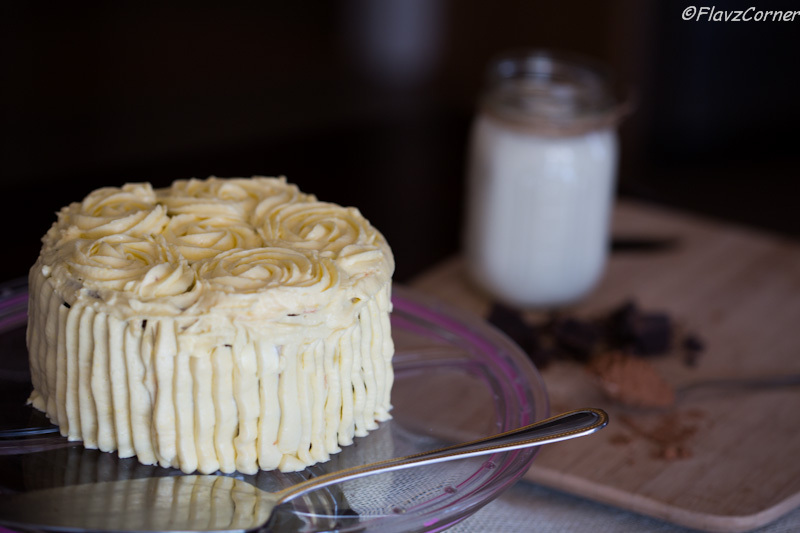 That being said Swiss butter cream frosting is one of my favorites. Since its Lenten period we don't use eggs, I was perplexed on what to go on top of the cake that I was planning to bake for my hubby's birthday. 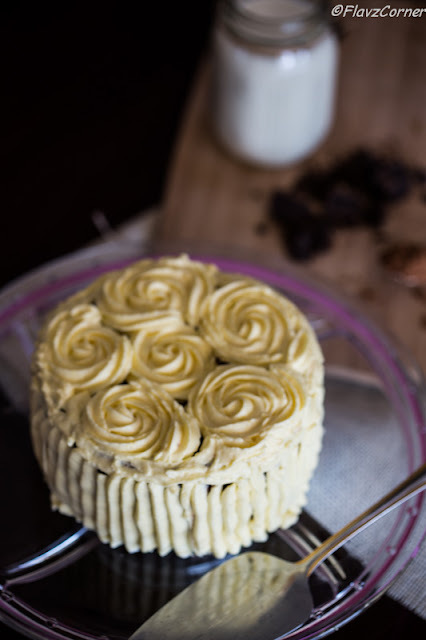 I decided to go with cream cheese frosting on the cake since I made some chocolate flavored cream cheese frosting for my son few days ago for a project he was doing in his school for creativity. They were making ginger bread house. He took the frosting to school and they didn't really use the whole container of frosting I made and they decided to munch on the graham crackers by dipping in the chocolate frosting. So I knew that it will be a good frosting to top my cake. I had all planned and on the way back from work after picking up my little ones I was so excited and told little Noah that I was going to make a layered cake with some roses on it thinking that it would remain as a secret till we present the cake before Daddy to cut it. In the evening when Daddy came from work, little Noah was anxiously waiting for him and he ran to him and told him the secret of baking the cake. Not that Daddy won't guess that I will be making a cake, but secrets never remain as secrets with my little ones :). Anyways I decided to bake a small 6 inch cake just enough for our family on Sunday. My recipe for frosting went out of control when I tried to tweak a little bit with sour cream, my measurements went wrong and there was total chaos. Hubby and kids were outside washing the cars as it was a pretty sunny day. All my plans to make a beautiful cake was going down the drain. The cream cheese frosting got little curdled and it was a bit hard to frost even though it tasted yummy with coconut flavor. 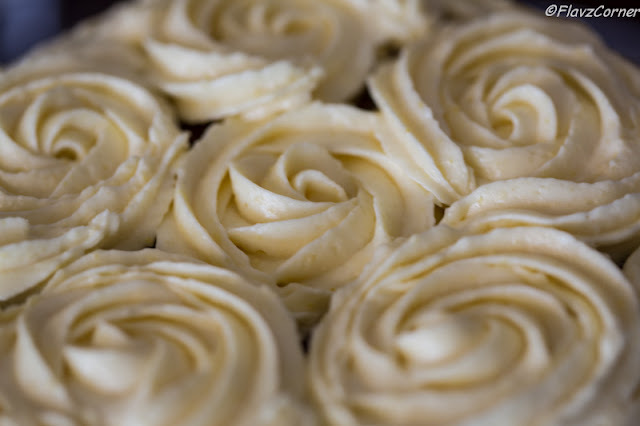 I decided to go forward with my plan of making roses with whatever frosting I had. By the time all came in for lunch, the decoration was over, kids were happy to see the roses even though they were not perfect. Hubby encouraged my first attempt on the roses, so I was totally happy about the cake. 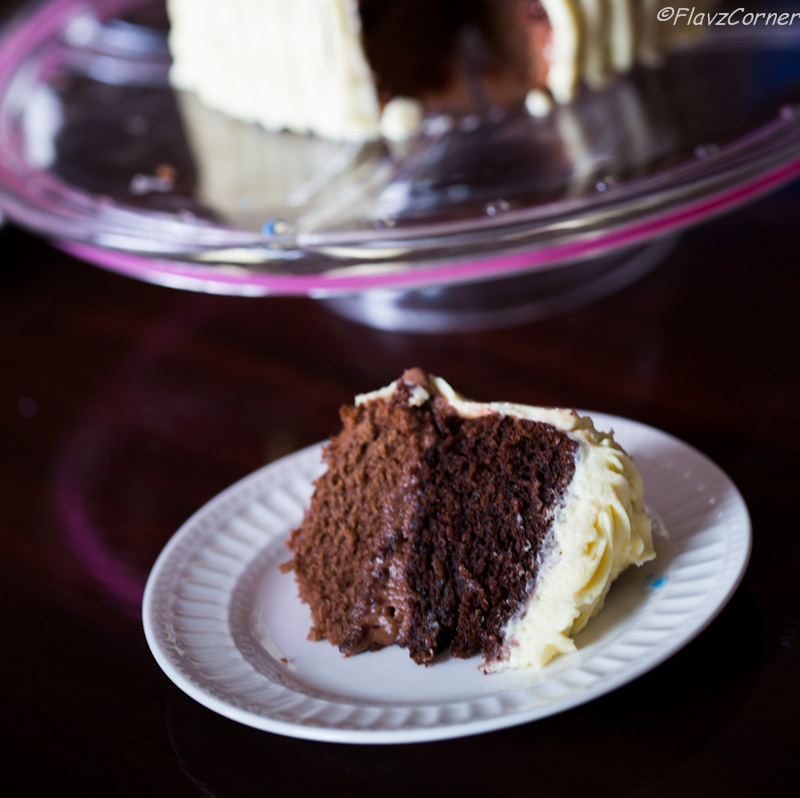 Since the cake was super moist and yummy, I thought to blog about it anyways. I will blog about the frosting once I perfect it. The cake recipe was tested few times and this is the perfect measurement I came up with all the ingredients to make it as a soft moist cake without eggs. Sift all the dry ingredients for dark chocolate layer except sugar for 3 times and keep it aside. Using an electric stand mixture with the batter paddle or using hand mixture mix all the wet ingredients with sugar for 2 minutes. Gently fold in the dry ingredients and mix for 1 minute till all ingredients are blended together and the batter is smooth. Don't over mix the batter. Line a 6 inch round pan with greased parchment paper and pour the batter into it. Bake the cake for 20 minutes. If using a thick metallic pan, the time should be increased to 25 - 30 minutes or till the center of the cake springs back when touched. Transfer the cake to a wire rack and let it cool completely. Meantime prepare the second cake for the lighter layer by following the above steps. While the second cake is baking, cut the bulged top of the first cake evenly using a sharp knife. Repeat the above step for the light chocolate cake too. Apply little bit of the frosting on the cake stand or cake board on which you are going to assemble the cake to glue the cake on to the stand or board. Place the light chocolate cake on the stand and apply almost 1/3 cup of nutella on top of it. Now place the dark chocolate cake above it and apply the cream cheese frosting on top and on sides. Pipe the cream cheese frosting or frosting of your choice to create some decorations. The left over can be refrigerated. looks really beautiful shibi... lovely! WOW, looks amazing! I'm glad I found your blog! Great recipes! More than the end result what rreally counts is the effort and the pain you took to make a special day more special. The cake looks awesome and I was waiting for the post ever since I saw it on facebook. The roses are also well defined and pretty. Why did u add sour cream to a cream cheese frosting? 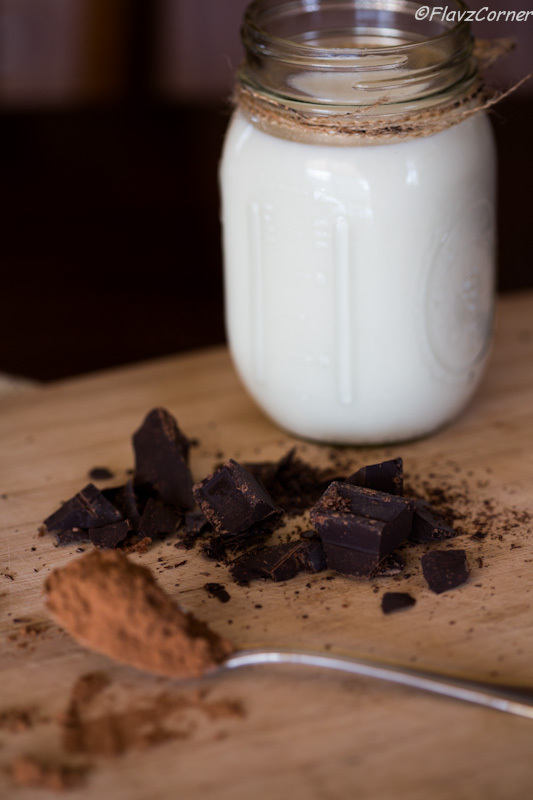 If you'd like you can check out my recipe , its pretty good and always worked for me from the very first time. The frosting was too sweet when I added some powdered sugar accidently so to compensate I added the sour cream, I was also baking a pizza (my next post) in the middle and the timer went off, so I had to get to that, so it all happened together. But the frosting was yummy. I saw some recipes on youtube with cream cheese and sour cream afterwards. I will check your post on cream cheese frosting. Actually, that decorating job is pretty good for someone who doesn't decorate! But I know what you mean - those over-the-top icing jobs are way beyond my ability (or interest, actually). Great looking cake - looks totally delish. And fun post. Thanks. Very moist cake. But I liked the roses more.